Cecilia Brunson Projects is pleased to announce an exhibition of new works by Josefina Guilisasti. For over a decade Guilisasti’s practice focused on the age-old genre of still life painting and its trick of the eye that thwarts the senses and cheats the mind. Her highly ambitious works in which the genre of still life is pulled apart both formally and conceptually tend to mean that she produces only one or two works per year. Guilisasti takes on the obsolete tradition of still life but brings it back to life with a whole new vitality. Her work revalues the anthropological, historic, cultural and socioeconomic dimension of historical artefacts from a contemporary perspective. For this exhibition, we will be presenting a new body of work made originally for the Museum of Decorative Arts in Santiago in 2014 in which Guilisasti intervened the museum with a series of china birds, cups and jugs, but fashioned out of silicon. The exhibition was called “Light Objects” and consisted of 55 silicon pieces moulded precisely from existing porcelain artefacts. The intervention was mounted on display cases and contrasted with the actual porcelain objects in the collection, making it very difficult to tell apart the porcelain from the silicon. A ubiquitous material in our everyday lives, silicon also invokes a component of the most mundane objects around us today such as kitchen utensils. Confounding our perceptions even further, an accompanying video that shows the silicon objects falling in slow motion is ‘the reveal’—the moment in which our dream shatters as the silicon objects fail to crack or break up and instead deforming and recoiling under the physical forces of gravity. 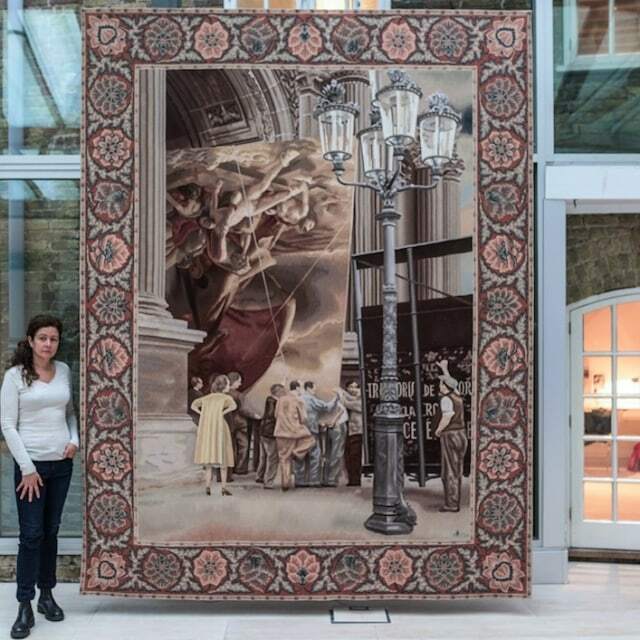 The exhibition also presents her most recent and ambitious work, “The raft of the Medusa,” a tapestry made of woven wool and silk yarn measuring 326 x 259 centimetres. In it a border of laurels surrounds a colour reproduction of a photograph taken in 1939, showing the moment in which Theodore Géricault’s renowned work The Raft of the Medusa was evacuated from the Louvre before the Nazi troops arrived in the city of Paris. The tapestry manages to weave different temporalities in sync: the historic and technical tradition of tapestry and master weavers; the time in which Géricault painted the canvas; and the perceptual moment of Hitlers’s invasion of France. Inspired by the recent looting of artworks and monuments in Syria, with this work Josefina Guilisasti sets a complex network of historical contexts.